National Aviation Day, 2016: Wave those flags, patriots! Celebrate? The White House issued no proclamation for 2016, but you may fly your flag anyway. If you’re near Kittyhawk, North Carolina, you might drive to Wright Brothers National Park and join in the festivities there co-sponsored by the First Flight Society. Activities include parachute jumping and a flyover. AOPA, the Aircraft Owners and Pilots Association, has a fly-in at Bremerton National Airport in Bremerton, Washington. 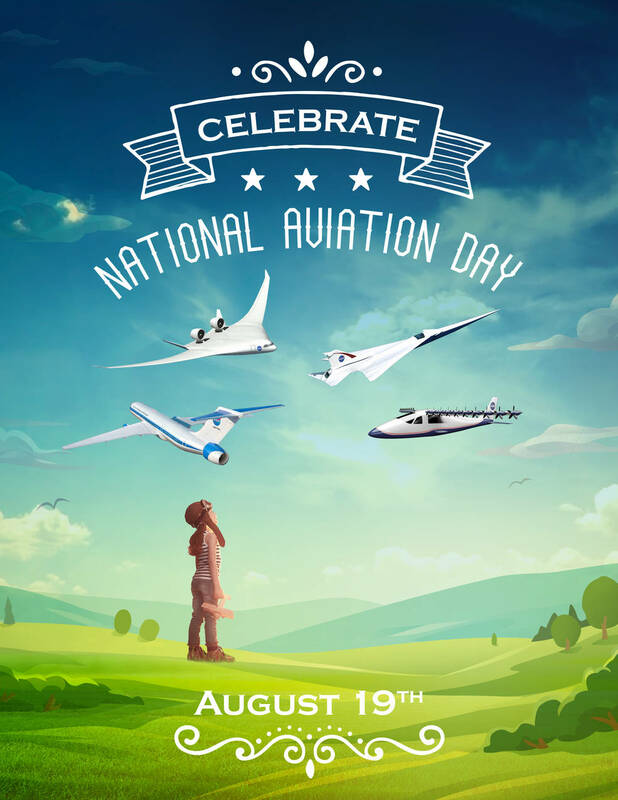 Their press release suggests a lot of activities you might want to participate in to celebrate aviation. Residents of Hawaii fly their flags on August 21, for Hawaii Statehood Day. …sometimes what a pilot sees in a day, people won’t see in their lifetimes.. I invite people of the world to come visit this beautiful country and its people. It was probably shot with a camera like a GoPro stuck on the window pointing out, in robot mode so the copilot and pilot gave full attention to flying the aircraft, and were not distracted by operating a camera in a cockpit. I mention this because US Federal Aviation Administration is looking into claims that selfies from cockpits — usually of small planes — may have contributed to accidents in the air. We may see some bans on shooting such videos in the future. Enjoy ’em while you can. Noodling around YouTube, I also found these videos of airplanes in and out of Queenstown, New Zealand. Flying over New Zealand from south to north. Nice views of Lake Wakatipu and Queenstown. Passing over Mount Cook – the highest mountain in New Zealand. Later a landing at Auckland Airport. Better videos of this route anywhere? Even cooler videos of other routes? Can’t say how often I’ve regretted not having a good video camera on my flight from Farmington, New Mexico, to Provo, Utah, in a Cessna, especially coming down Provo Canyon. But alas, that was before video was even portable . . .
Old Jules tells a great story here about cranking up the old Cessna and climbing high enough to watch the vast powers of the U.S. military run training operations in the New Mexico Desert. This is the place to insert the heroics of pilots in various times of stress, Wally Stewart and his crew bringing their B-24 bomber back over the Mediterrannean and dropping it perfectly on the runway, where it fell apart from the bullet holes [See KUED resources here]. That brave American Airlines crew in the DC-10 over Detroit, Flight 96, who lost hydraulic control when the rear cargo door blew out, and after a string of blue talking, brought the plane down safely (one flight attendant died in the explosion). Those United Airlines pilots who brought the DC-10 Flight 232 down in Sioux City, Iowa, after the rear engine flew apart and destroyed all control of the tail and rudder. That brave U.S. Airways crew that executed a perfect landing in the Hudson River with Flight 1549. I think if you talk with pilots much, you get the idea that they like things a little on the edge. They don’t develop those cool, steely nerves that save lives by having nothing go wrong, ever, or by not pushing their aircraft where the wonks at the Federal Aviation Administration in Washington, D.C., say aircraft should not be pushed. We hope they do all this pushing in flight simulators; but we also know better. 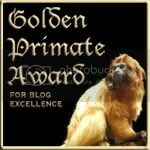 Cessnas, and just violating some of the rules, don’t deserve those accolades, really. These stories tell how pilots might develop the skills the brave guys use later. But they are stories, nevertheless, and they deserve to be told. They may not save your life flying, but they’ll enrich your life, and help you get through the stuff here on the ground. So go read Old Jules’s tale. Then come back here; here are a couple of stories, true as I remember them (a couple of which really should be tracked down; the American west of the latter-half the of 20th century is full of these stories, and they need to be told). Years ago, while I was staffing the Senate, my brother, Jerry Jones, who spent a good deal of time in his last 20 years in Page, Arizona, called to ask me to check in on a Senate hearing on some FAA issue or other. Turns out someone — National Park Service, perhaps? — was asking FAA to significantly tighten rules on flying around NPS stuff, including around Rainbow Bridge National Monument. 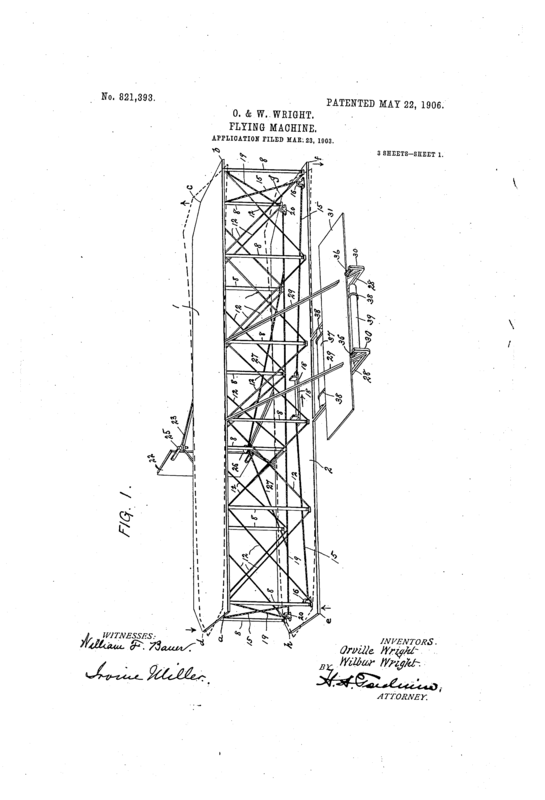 Apart from the usual issues of air traffic congestion and safety around conflicts between “fixed wing and rotary wing aircraft” (airplanes and helicopters) in and around the Grand Canyon, there were complaints about small plane pilots flying under Rainbow bridge. The thing really is massive, and you could put the dome of the U.S. Capitol under it, so it’s about 500 feet high . 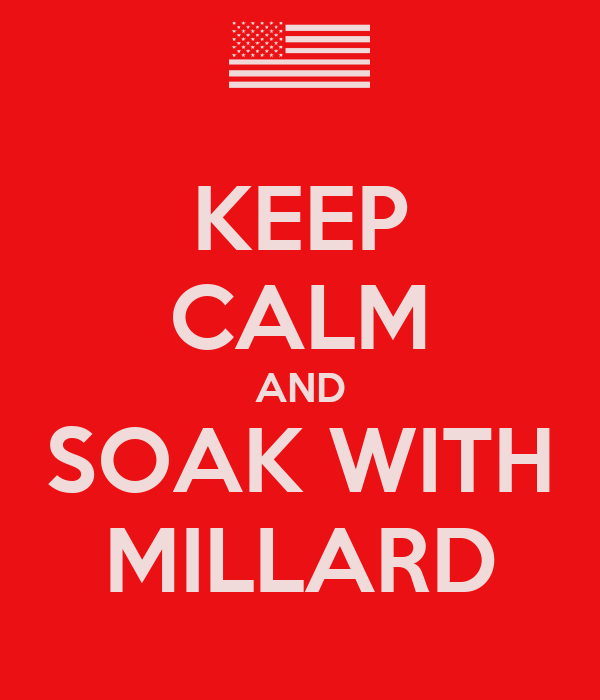 . . what barnstorming pilot could resist? A somewhat skeptical group of senators quizzed the FAA and Park Service guys on what the problem was, other than noise and hubbub to hikers (who had hiked a mile from the marina on Lake Powell). About that time Sen. Barry Goldwater, R-Arizona, shuffled into the hearing. Goldwater was very protective of grand things to see in Arizona, like Rainbow Bridge, and he was also a pilot. 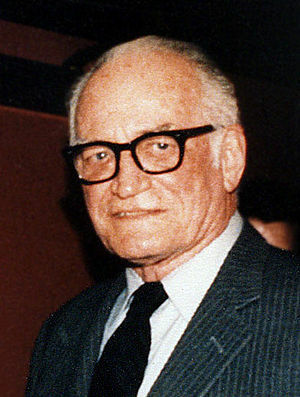 Barry Goldwater, U.S. Senator, R-Arizona. Wikipedia image. At some point, one of the officials making a case to yank licenses from pilots who pulled the illegal stunt made a comment that questioned the sanity of any pilot who would do such a thing. Goldwater sat upright. You mean any pilot who would do such a thing is crazy? Goldwater asked. Well, yes — and we don’t want crazy people flying airplanes, the official said. How about such crazy people representing the people of Arizona and passing judgment on your proposals? Goldwater asked. Then he said he didn’t want an answer to that, that he had some grave reservations about the proposal, and he left the hearing. I later caught a conversation with the senator in a hallway, in which someone asked him directly if he’d ever flown under Rainbow Bridge, and he said something like, not enough times that the FAA needs to worry about it. Brother Jerry started a public service effort in his Page days, Page Attacks Trash, a project to clean up litter in and around Page, on the Navajo Reservation, and in the Lake Powell National Recreation Area (NRA) and Rainbow Bridge NM. It was a great clean-up effort, got the support of the Salt River Project (who operate the Navajo Generating Station in Page); it was big time. Iron Eyes Cody, who did the famous anti-littering ad featuring the tear in the eye of an American Indian, sometimes dropped in to help out. Jerry arranged for some television Public Service Announcements (PSAs) filmed in and around Lake Powell, to fight littering. 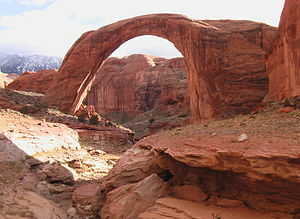 One of the spots was shot at Rainbow Bridge. Jerry’s health had been failing for years, but he’d get his cane and make the hike, just to watch the proceedings and keep it all going well. They finished the spot, broke sticks (as they used to say in the filming biz), and were walking back to the boats at the marina, Jerry and his cane far in the rear. Just before the film crew rounded the bend, they heard a small airplane buzzing around and the tell-tale cut of the engine, to lose altitude, before roaring the engine to pass under the stone formation. One of the cameramen had some footage left, and had the presence of mind to turn on the camera and film the thing. Well, the Park Service and FAA were outraged to hear of the event. They subpoenaed the film footage, and blew up every frame to see if they could get the tail number on the airplane. To be honest, I don’t know how that turned out. I do know that on my wall I have a large photograph of my late brother, two by two-and-a-half feet, waving to the cameraman, with Rainbow Bridge in the background. That frame didn’t have any useful information, and the law gave him the photo. The West Utah Desert remains desolate. On the border between Nevada and Utah, there ain’t much of nothin’. A few roads connect a few ranches, but there’s a good reason U.S. 50 and 6 out there is known as “the loneliest highway in the world.” Bandits might be regarded as welcome company out there sometimes. Anyway, it was expensive to run copper wires out there, say, 50 miles, to an isolated ranch house, or a lone gas station, or some other building said to be a business. So mostly, AT&T didn’t do it. People who lived and worked out there just had to get along without phone service. Enter a guy named Art Silver Brothers (I think; my memory fades, too), who figured out that radiophone service worked okay. Give people a radiophone — a device which existed then, but which required several pounds of gear and a lot of juice, relatively — and they could dial up the “local” grocery store to check to be sure the milk was good this week, before driving 50 miles to get some dairy whitener for the coffee. Art strung wires where he could, using REA-installed power poles, or fence poles, or whatever he could, and thin, light copper wiring. His Beehive Phone Company was one of the last truly independent phone operations in the U.S., serving a grossly underserved area with patchy service. He didn’t get rich doing it. He was the company’s only employee most of the time. Stringing copper over 50 miles for one phone, a company can have difficulty maintaining such lines. Art had a pilot’s license, and he learned he could spot downed lines and other trouble from the air . . . and it was just one step to landing his small airplane on the local road, fixing the problem, and taking off again. Well, that got the ire of the FAA. They said he shouldn’t do that. They argued that he was impeding traffic an imposing dangers. He said he was keeping lifelines open for people in far-flung places, and it was not a problem for traffic on roads where there might be two vehicles a week passing by. FAA paid for traffic studies on a bunch of those roads; and they enlisted the FCC to try to shut down Silver’s operations. Remember, part of the system was wired, and part was radio. Turns out that in those pre-cellular days, the radio frequencies Silver used were in the “emergency” spectrum — radio frequencies used by cops and firefighters in places where cops and firefighters existed. FCC took to taping the “phone conversations” of Art’s customers, and in yet another hearing in the Senate, charged that Art was abusing emergency frequencies. The star audio was a tape recording of a woman ordering a significant amount of liquor from a liquor store that served probably six counties in eastern Nevada. FCC argued that obviously was not an emergency, and it amounted to an abuse of spectrum, and it was enough of an abuse to shut down the phone company. Art finally got his chance to explain. Someone quizzed him about that liquor order, and whether that was appropriate use of emergency radio spectrum. Those were good days to attend hearings in Washington. The Tea Party has ruined all that. That’s my story; the true facts are probably better. Overflights in the area, in Grand Canyon, in Glen Canyon NRA, over Rainbow Bridge, and other sights and recreation locations remains a tough issue, for economic, noise pollution, and safety reasons. See this article from the 2011 Navajo Times on a hearing to develop a Navajo Nation position on flights; see my earlier post on airplane collisions in the Grand Canyon. 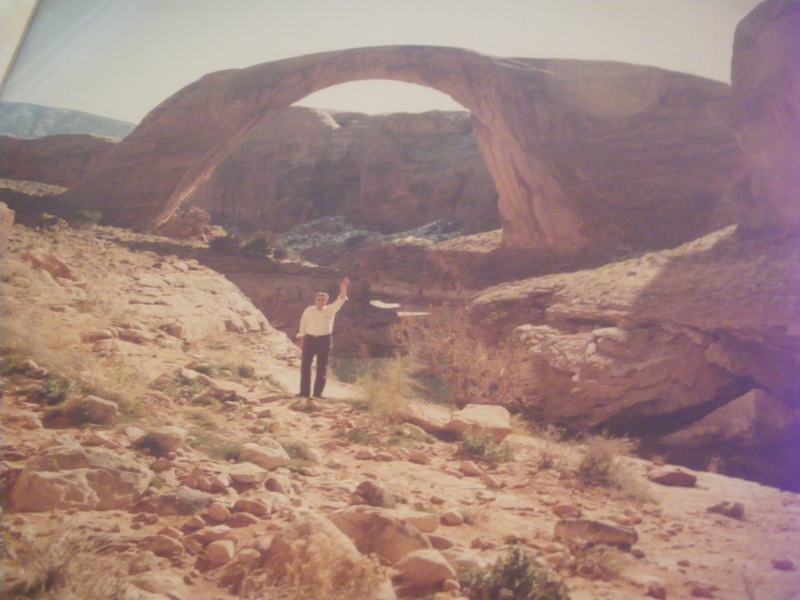 A bad snapshot of the picture on my wall, Jerry Jones waving from the path in Rainbow Bridge National Monument, moments after a small aircraft flew under the Bridge.